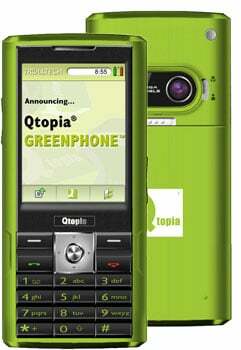 The Greenphone hardware compares favourably with most consumer devices, and it's built around a 312MHz XScale processor, with 64MB of RAM and 128 MB of Flash (there's also a Mini-SD card slot for up to 512MB of extra storage). Unlike most phone format devices, there's a QVGA touch screen, so you can develop applications that work on keypad-less devices. Connectivity is through a GPRS modem and USB. While there's Bluetooth and a 1.3 Mpixel camera, there's no WiFi. The device costs $695, with development packages adding at least $195 to the cost. Open the box and you'll find a CD with the SDK (alternatively you can download it from www.qtopia.net). You shouldn't compare the Greenphone to your everyday mobile SDK. This one lets you work with the phone kernel, as well as the applications – and then deploy it to actual hardware. However, it's not a true open phone; it's an open development platform for what may end up as closed devices. That may seem a contradiction in terms, but when you're developing applications that need deep integration with a phone's hardware it's actually a key requirement. Trolltech have made a smart move with the Greenphone's SDK. Instead of configuring various packages for a selection of operating systems (and then having to support them), they've made a smart decision: virtualising a development platform. What Trolltech has ended up delivering is a pre-configured Debian Linux environment. This has been filled with development tools and documentation, and then turned into a VMware image. There's no need for Trolltech to distribute VMware, the free VMware player is widely available. Once you've installed the Trolltech image from the bundled CD-ROM (or from the qtopia.net web site), you can start developing code straight away. The SDK contains all the compilers you'll need, along with source code and plenty of documentation. The amount of code you'll get depends on the version you've chosen – the Community edition only contains the code for the applications, you'll need to Professional edition for the full platform source. If you've worked with QT, you'll find Qtopia a very familiar environment. It's made easier with plenty of online documentation and a design tool for building UI components. There's even a set of tools for managing internationalisation (something that's increasingly important for mobile application development).